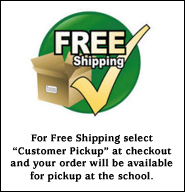 Welcome to the Mitchell Elementary School Online Store! Proceeds from the sales of items through this online store will benefit the Mitchell School PTO. Please indicate teacher's name and grade in comments at check out.